OmniGraffle (possibly the best app on the Mac) makes reasonable SVG. I hope it gets better and better with each release, though. If I wanted to take its output and turn it into an interactive applications (like the previous two previous article) with Angular, I have a new problem - OmniGraffle won’t round-trip preserve my inlined Angular application code. You might want to increment the ‘root’ SVG source, AND preserve the Angular bits and pieces you’ve typed into it. Luckily, there’s an imperfect source-control solution that involved two branches, and merge. That’s what I’ll outline in this article. 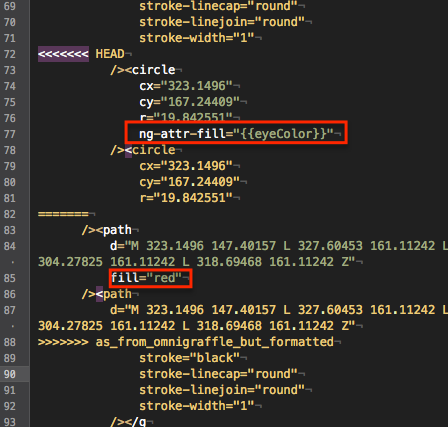 usage of that model in a color ‘fill’ attribute. I then ran xmllint over it again. This time, there’s a shortcoming in Xmllint that required remediation - it wants to write @@, when browsers will only accept @@. I raised a feature request, but had to manually fix it after running xmllint. I pretty printed it again, with the xmllint tool, before checking it in. Automatic would have been preserving the original change highlighted in red, and changing @<circle … />@ to @<path … />@ appropriately. Merge science gets better and better every year, though. One day it will automatically do what I wanted before I started this article. Hopefully.